With my family at the anti-GMO, anti-Monsanto protest in Missoula, MT, June, 2013. I’m holding the “Love and Nurture” sign. 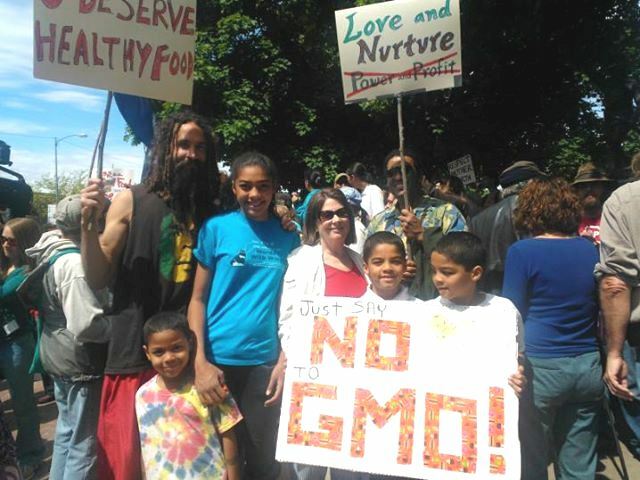 My wife, Barb, is in the center, surrounded by grandkids, and our son, Noah, is holding the “Healthy Food” sign. It is my hope that this blog will become a vehicle for finding ways to live in harmony with Earth and create alternative, sustainable societies. I use the plural (societies) because I don’t think that these large meganations are sustainable or managable. There are probably a multitude of sustainable, small-scale society lifeways that match specific ecosystems and are feasible within the laws of nature. We will probably need much exploration, experimentation, and trial and error in this learning process, because there is so much knowledge that we have lost. The other thing that we need to discuss is how to have societies without currency (money). Much more on that later (see essay, “The Problem With Money”). This is all I have to say for this “About” section right now. It will be interesting to see where this goes. Thank you for making your knowledge and wisdom available through the internet. You might enjoy listening to Good Dirt Radio, a media organization that is aligned with your values and ideas. GDR produces 5-minute eco-spots about people making change happen in their own lives & filled with great info about living lightly on Mother Earth. Their audio podcasts are available on their website at http://gooddirtradio.org. Thank you for the recommendation, Jules. That looks like a very encouraging and useful website. Sorry it took awhile for me to reply, I just got back from a road trip and had lots of messages. He George; Just landed on your blog. I didn’t know you were doing this, and I didn’t know you were experimenting so much with huglecultur…..something I’ve been inclined to give up on, but don’t think I got started on it right in the first place. I’d love to come see your innovations! Come Spring! Come completion of dissertation!! Hi, Anita. I’m glad that you found this and I am looking forward to hearing more of your thoughts. Also looking forward to you coming over here in the Spring (and Summer)! Hi, Rose. Thank you for your kind comments. There are many people, internationally, indigenous and non-indigenous who are creating and living the real life, sustainable societies that Earth needs. I am interested to hear your thoughts an some of the things that people are doing, mentioned in Part 2 of my article on this blog called, The End of Money. Apocalypse4Real Scientific evidence and updates on methane releases and their contribution to climate change, with discussion. Climate and War A Facebook page for exploring and discussing the connections between climate change and warfare. Climate Emergency Institute Up-to-date stats and links on what the climate looks like now and how much has changed over time. Climate Reanalyzer Excellent graphics, clearly explaining climate science and updating current and changing conditions and patterns, for non-scientists and scientists alike. Convergence State An informative and provocative blog dealing with many current issues related to our present global crisis. Deep Green Resistance Perhaps the most committed, daring, and devoted defenders of Life on Earth, as an organization, that I have heard of so far. DeSmogblog.com “Clearing the PR Pollution That Clouds Climate Science” is the motto of this blog, and the writer/reporters very admirably live up to that name. Great investigative reporting, fighting lies with truth. Dialogues on Global Warming Physicist, Christopher Keating is very adept at providing scientific evidence against all of the denials of man-made (Anthropogenic) contributions to global warming. Inspiration Green Creative, beautiful, joyful green ideas and projects. Megaload Facts by Wild Idaho Rising Tide What everybody needs to know about why we are trying to stop the megaloads. Natural Homes A wonderful collection of examples of Earth-friendly, sustainable building by Earth-friendly people from all over the world. Permaculture Institute Examples of what some people are actually doing to create and revive sustainable alternative lifeways. Permies.com Permaculture ideas, examples and links, mostly from people in western Montana, Idaho, and Washington. 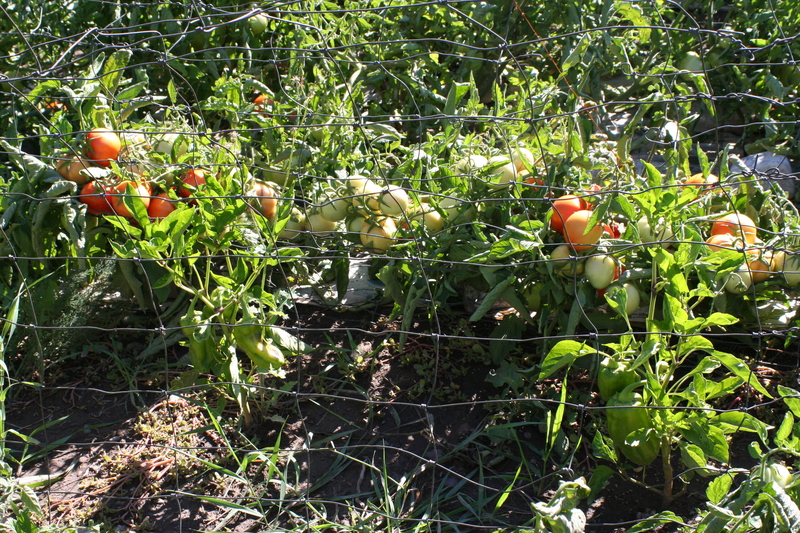 Includes a multitude of discussion forums on permaculture-related topics. Rev. Billy and the Stop Shopping Choir Truly an inspiration. Shareable “Solutions journalism,” including alternative economics, similar in some ways to “Yes!” magazine. Skeptical Science Great scientific answers to nearly every climate change denier obfuscation or false claim. Clearly laid out chart with links to expanded answers and more info. Statement by indigenous spiritual elders of North and South America This statement explains very eloquently the crisis that we of the Earth now find ourselves in, and provides their sense for a direction out of the crisis. Transition Network An international network of people who are actually creating and practicing green alternative living as communities. Some are actually creating alternative, sustainable local economies. Includes links to local autonomous Transition communities, worldwide. Yes! Magazine This magazine consistantly provides us with many positive examples of the good things that people are doing for Earth sustainability and justice. If you ever need an uplifting story or a reason for hope go here.